Fun With Puzzles Brain Teasers Good Puzzles Kids Puzzles Picture Puzzles Puzzles for Teens Stroop Effect-Can you pass this color test? Stroop Effect is the demonstration of interference in the reaction time of the task. e.g. it is easier to read the name of the colour from the written word if that word is written in the same colour as the word represents. However, it becomes very difficult to read the name of the colour if the word colour is different from the colour which is being mentioned in the word. This effect is named after John Ridley Stroop who first published about this effect. Can you pass this colour test? 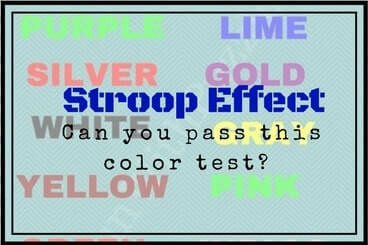 Here is the test to understand the Stroop Effect. Here some colour names are given. 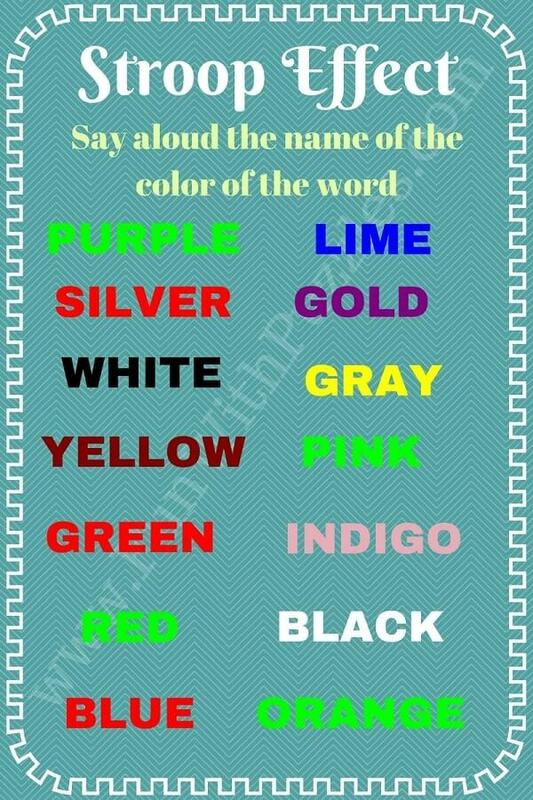 However, your task is to read aloud the name of the colour of the word. Try to read it as fast as possible. Let us see how many of these colour names you can read correctly? Can you read the colour of the words in this Picture? 1. Picture Puzzles for Teens With Answers: Check out many different types of Picture Puzzles which will test your visual and observational skills. 2. Math Circle Brain Teasers For Teens & Adults: If you like solving some Mathematical Puzzles, then you should try these Maths Circle Brain Teasers in which your challenge is to find the missing number. 3. Find the Mysterious Creature in Video Puzzle: Try to solve this Video puzzle by naming the mysterious creature shown in the video. 4. Thermometer Sudoku Puzzles: If you like solving printable Sudoku puzzles, then try out this standard Sudoku variation called Thermometer Sudoku.